Insta’s Model 718 Automatic Swing Away heat press machine is, with its 15”x15” platens, the smallest of our full-sized automatic presses. 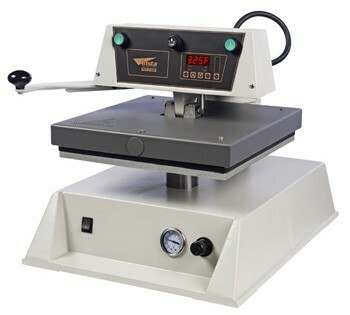 The 718 is a work-horse and has long been considered the most reliable and durable heat press on the market. 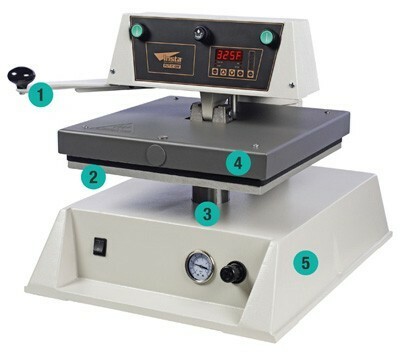 This pneumatic heat press is used globally, by contractors for many of the world’s top apparel brands, and is chosen for its fast heat recovery, accurate temperature, even pressure and its ability to achieve consistent results under 24/7 use.. The Model 718 has been strategically designed to generate & evenly distribute tremendous pressure throughout its upper and lower platens. And, its cast-in tubular heating element heats the metal from within, to produce constant and long lasting heat. A successful heat transfer application requires 3 key elements to work in tandem– time, temperature & pressure. The Model 718 has mastered those elements and gets the job done every time. The pressure source is strategically placed under the center of the lower platen and uses struts to drive that pressure out to all corners. The result is an even and heavy duty distribution of pressure that is unmatched by other heat presses in the market today. Its tubular heating element is cast into the aluminum upper platen, heating the metal from within. The element is coiled throughout the upper platen to provide a reliable and even circulation of heat out to all corners. Machines made from cast metal are considered to be the highest quality and are strong enough to withstand heavy use without warping or bending. The 718 is extremely durable and, if cared for properly, can last up to 25 years.